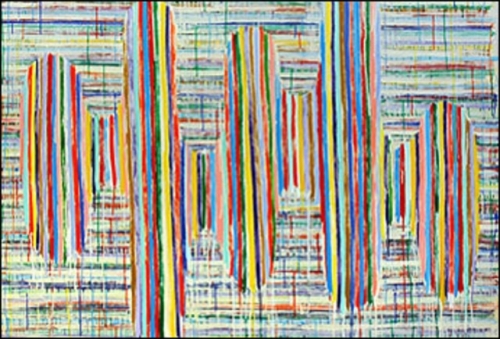 So heavily influenced by the Washington Color School, Steven Cushner’s work looks far from contemporary, but that’s OK. With a keen sense of history, he summons forth the stripes of Gene Davis, the concentric lines of Kenneth Noland, the geometry of Alma Thomas, and the soft shapes and drips of Morris Louis. Naturally, he also utlilizes the palette of all of the aforementioned artists—a vibrant interaction of primary and secondary, cool and warm, bold and pastel. Unlike some of his predecessors, though, Cushner does not strive for flawlessness, and the drips and imperfections of his paintings make them more hospitable. Color School paintings such as his have an energizing effect—they’re a palate cleanser for the eyes, heightening senses for whatever art you see next. One look at “Panorama” or “More or Less,” and everything will seem a little bit brighter.